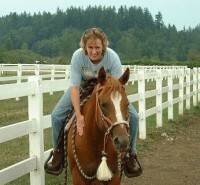 The horse/human relationship... an unconventional approach for personal development and growth. 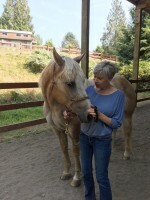 Join me, along with Darcy Pariso, Animal Intuitive, and my Equine Partners for an amazing 2 day workshop at our lovely Centaur Development Wellness Ranch in rural Snohomish, Washington. Communicate with Animals Through Expanding Your Own Energy and Intuition. Here is a revolutionary Model for tapping into Horse Energy and Wisdom While Learning About Yourself. Join Darcy Pariso, Animal Intuitive and myself for a 2-Day experience learning how to communicate and engage with horses while tapping into a powerful source of wisdom for profound insights. We have combined our knowledge to create an unconventional approach to deepen your understanding and communication with horses, self and others. The days are intentionally set 2 weeks apart so you can practice the basic philosophies and skills taught during Day-1 (April 21st) and then move on to the more advanced energy work on Day-2 (May 5th). Each exercise is designed to gradually increase your awareness of your intuition and ability to communicate and engage with horses. We use tools and encourage experiences that you can use immediately with your animals! Have always wanted to learn how to communicate with animals. Want to have healing experiences with majestic horses. Have a desire to connect with others on a soul level. Want to learn about healing techniques. Seek an extraordinary life experience. Who want to spend time with and learn from the well known animal communicator Darcy Pariso.